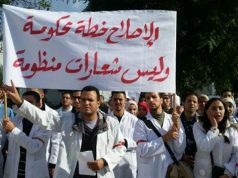 The teachers wore white coats and carried banners with slogans such as “the people for the abolishment of contractual employment” and “freedom, dignity and social justice” as they marched around Rabat. 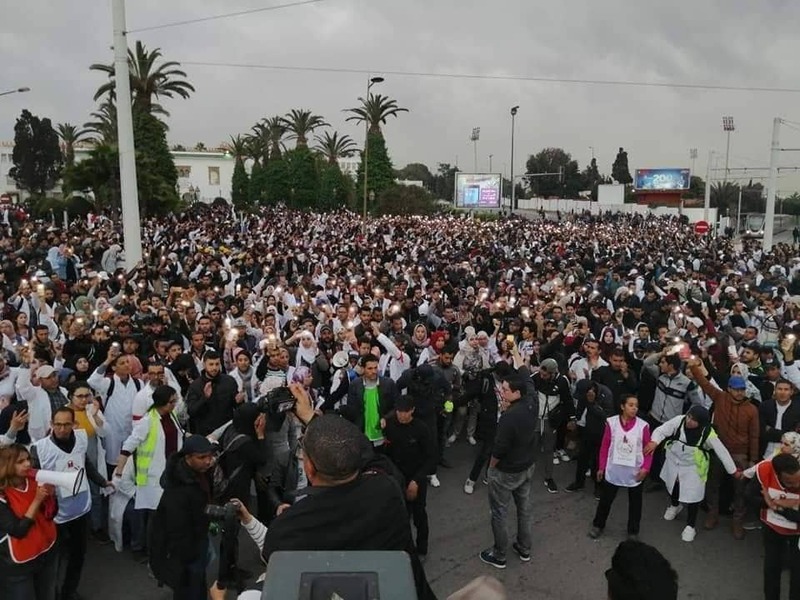 Rabat – Saturday night to Sunday morning, young contractual teachers decided to camp outside of Rabat’s parliament in protest of the government’s recent decision to keep contractual teaching positions. 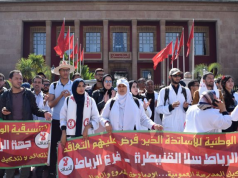 The teachers, aged 20-30, donned white coats and carried banners with slogans such as “the people for the abolishment of contractual employment” and “freedom, dignity and social justice” as they marched around Rabat during the day. 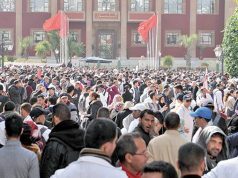 There were approximately 10,000 protesters on Rabat’s streets, according to Reuters. 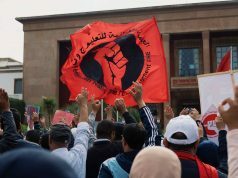 As night fell, the protesters marched from the Ministry of Education to the Parliament, where they lit candles and set up an improvised camp in front of Rabat’s parliament. 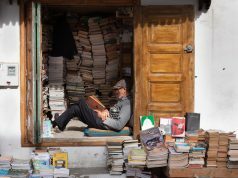 Authorities initially attempted to negotiate with the contractual teachers, but when the teachers refused to leave after two hours, police and auxiliary forces used water cannons and batons in an attempt the disperse the protest. 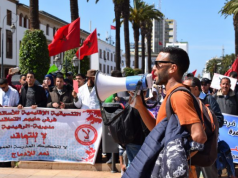 March 23 was chosen as the day for this large protest in reference to a mass student protest in Casablanca that occurred on the same date in 1965, which ended in as many as 100 deaths according to the Union Nationale des Forces Populaires (UNFP). The protest follows the government’s unwillingness to change the laws on contractual employment. Contractual employment doesn’t allow the teachers to seek a permanent position in the education sector, and they can be fired with 30 days of the contract being signed. Contractual teachers are also only paid MAD 5000 month, putting in them in the government’s ninth pay grade. Many are protesting to receive a raise to the 10th pay grade, adding an extra MAD 1500 to their salary. Approximately 55,000 contractual teachers have been hired since the practice was introduced by the government in 2016. The protests began on March 3 and are showing no signs of slowing down. 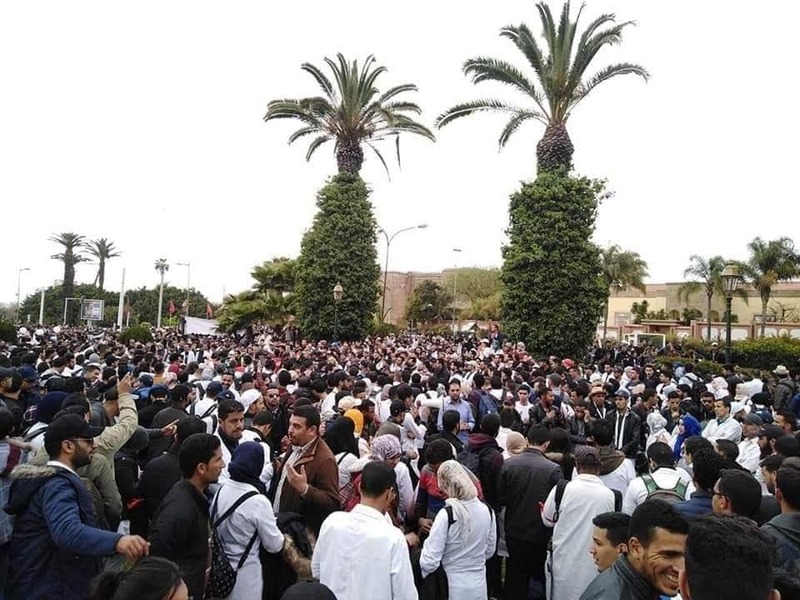 On March 10, the government tried to find solutions to ease the tension, such as proposing the contractual teachers by hired within the regional academy they currently work, but protesters said this was not enough and they would keep protesting until the contractual hiring of teachers was abolished completely.